Water and sewage infrastructure and other utility services represent a significant investment on the part of most municipalities. For well over 100 years, the distribution networks for utility services have been located underground in pipes or ducts that are laid, repaired or replaced by trenching from the surface. In cities and urban areas, these distribution networks are located underneath roads. This often makes access difficult, particularly in areas congested with traffic and buildings. When pipeline infrastructure is not well maintained, inefficiencies occur. For example, in water distribution systems, this can lead to leakage and possible water shortages. In sewage systems, cracked and damaged pipes can cause wastewater seepage, leading to contamination of groundwater. These problems often give rise to related health and environmental impacts. Perhaps the largest share of the trenchless market is represented by the requirement to rehabilitate defective pipelines with some residual structural and physical life, which can be used as a structure for the new line. Examples of rehabilitation techniques include Cured-in-Place Lining (CIPP), Close-Fit Lining, Slip-lining, and Spray Lining, all with their own-patented variations, as well as various other localised repair techniques. Variations relate to the material used, wall thickness provided to offset structural or physical defects, the rate of rehabilitation, and the minimum time of shut-down for the existing service. The rehabilitation of small diameter underground pipes is a new area where the cost competitiveness of Trenchless Technologies is well recognised. Many utility pipelines, sewage in particular, become defective due to the corrosiveness of modern effluents. They also suffer from overloading and loss of capacity. One of the advantages of rehabilitation is that the new lining materials have a much lower surface friction coefficient, thus it is often possible to increase the capacity of the refurbished pipe without increasing its diameter. In CIPP, a fabric impregnated with polyester or epoxy resin is inserted into the defective pipe and inflated to fit against the pipe wall. It is then cured by hot water, steam or ultraviolet light. The system has many variants and can be designed to provide different wall thicknesses to meet particular needs. One advantage is that the lining adjusts to variations in the size of the pipe. It is widely used for the rehabilitation of gravity sewers, including laterals, and usually results in no loss of capacity. Close-fit linings take many forms. The lining is deformed through a swage (a metal die) or manufactured in a folded state so that it can be pulled into the host pipeline. Various methods can then be used to allow the lining to revert to its full size or to the shape of the host pipe. Spirally wound liners are a form of close fit in which a PVC strip is fed though a small access into the defective pipe. The PVC strip is then helically wound into place against the pipe wall using a winding machine operated from within the pipe. This technique is particularly useful for emergency repairs and for adding strength to pipelines that have been weakened. Slip-lining involves putting a pipe within a pipe and grouting the resulting annulus between the new lining and the old pipe. This causes a reduction in capacity and the process has now been modified using polyethylene to reduce the thickness of the liner and to minimise the size of the annulus. Spray linings using cement or resin are widely used on water pipelines. Spray lining materials have to be used carefully and approved by regulatory authorities due to the potential for releasing solvents and residues. Spray linings are suitable for dealing with leaks but not where there are structural defects. Localised repair techniques make use of robots in conjunction with CCTV cameras to clean, prepare and fill cracks and voids with epoxy mortar. This is often a cost effective way of dealing quickly with an isolated problem in an otherwise sound pipeline. The ease of transport and mobilisation of the equipment is an advantage. 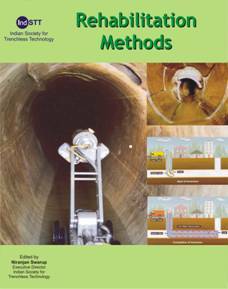 All these methods discussed in here is a sincere attempt to provide a reference tool to all the stakeholders facing the requirement to rehabilitate or manage a Subsurface Utility Network where open trenching is not possible. Users are advised to exercise utmost care in using these methods as they are meant to provide the introductory information only and these should not replace the project designs and sound engineering selection processes.